Beyond providing data for all 32 NFL teams, PFF also supports network broadcasters with game-preview packets that are used to enhance the in-game experience for fans and viewers. This Titans-Chargers preview features the same information our broadcast partners use for team research and in-game production. 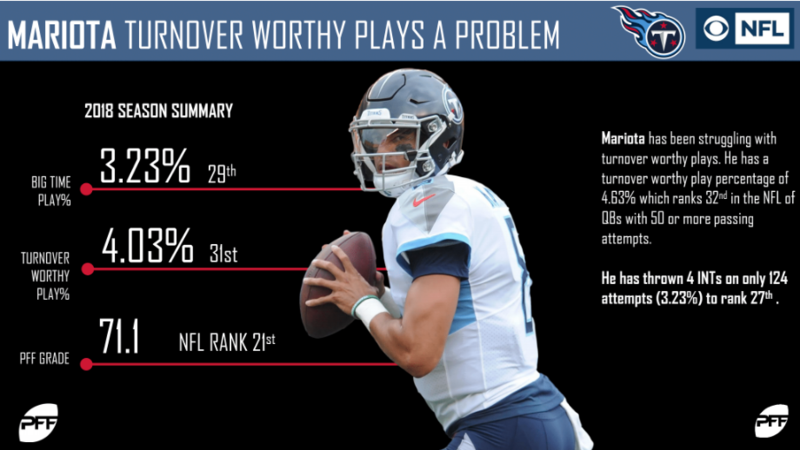 Marcus Mariota hasn’t been himself in the first six weeks of the season, ranking near the bottom in both big-time throw percentage and also turnover-worthy play percentage. His overall grade has also taken a hit, going from 76.5 last season to 71.1 in 2018. Regardless, the Titans have been winning games, but Mariota will have to clean up his play if they hope to keep it up. 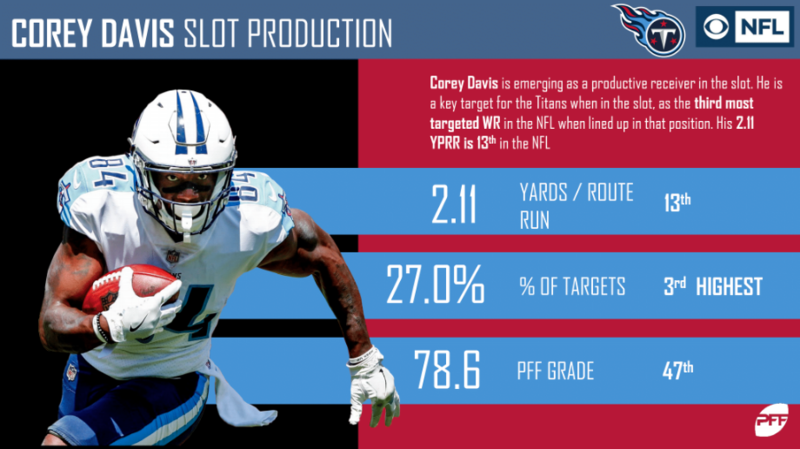 Corey Davis has been a slot machine this season. He has been targeted on 27% of his slot routes, making him the third-most targeted wide receiver when lined up in the slot. To go with that, he has gained an average of 2.11 yards per route run from the slot, ranking 13th among qualifying wide receivers. Jurrell Casey has long been a force in the trenches and this year is no different. 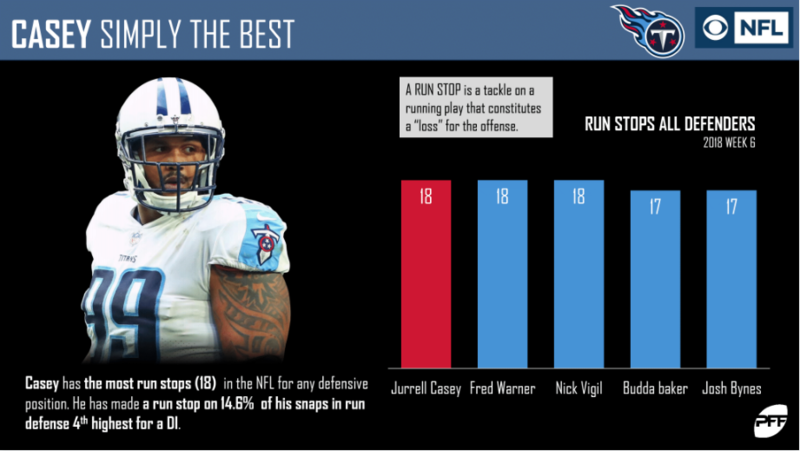 With 18 run stops on 123 run defense snaps, Casey ranks fourth in run stop percentage among interior defenders. Kevin Byard is having another solid season in his third year. He has allowed a passer rating of 51.6 this season, ranking 11th among safeties. Byard also ranks in the top 20 in coverage snaps per target and yards allowed per cover snap. 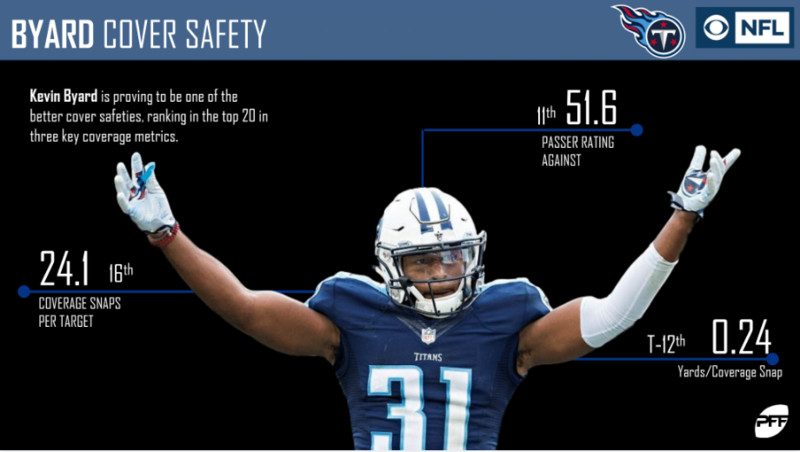 With an overall grade of 75.3, Byard ranks 22nd out of 91 qualifying safeties. 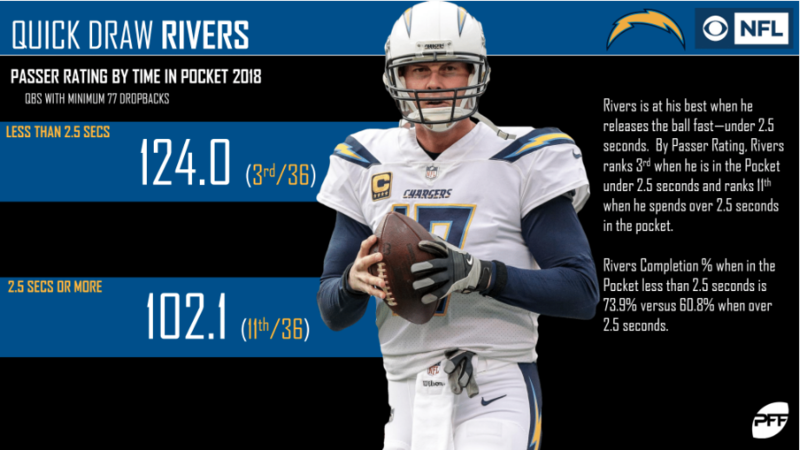 Philip Rivers has been unstoppable when getting rid of the ball quickly (less than 2.5 seconds). His passer rating of 124.0 on throws in less than 2.5 seconds ranks 3rd out of 36 qualifying quarterbacks. The Titans’ defense will have their hands full with the feisty veteran and his quick trigger. The best running tandem in the NFL? 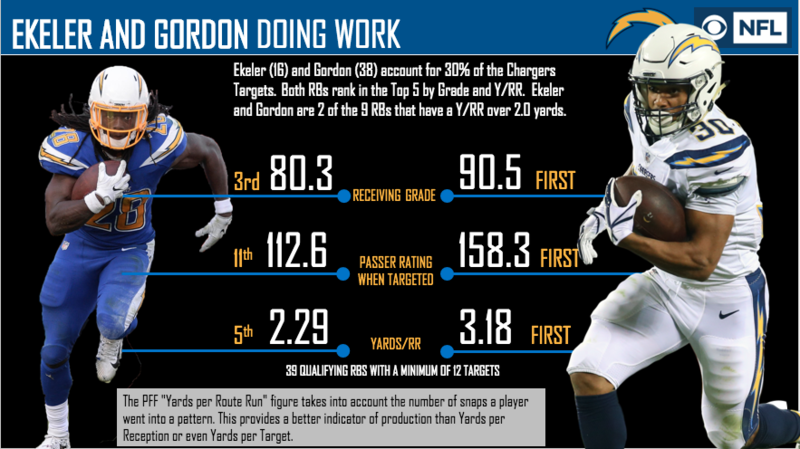 Austin Ekeler and Melvin Gordon have been the league’s best one-two punch at running back in 2018. Both of them have overall grades that rank in the top five among running backs and they’ve both been mighily productive in the passing game. 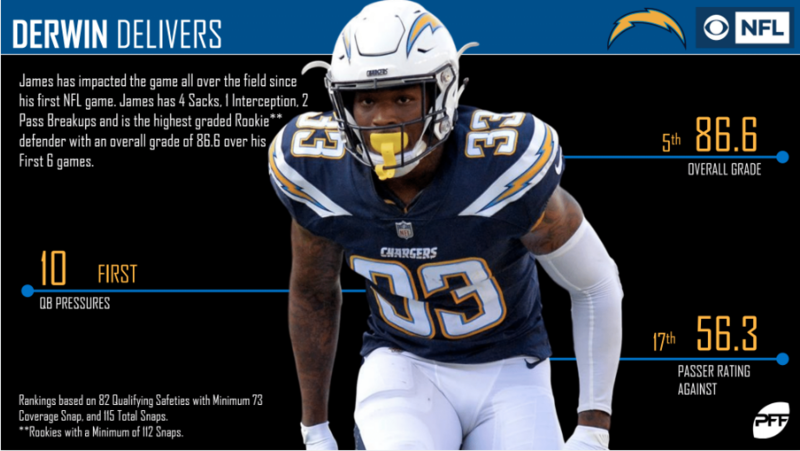 Derwin James‘ versatility was probably his main selling point coming out of college, and he has lived up to it so far. He has pressured the quarterback 10 times, ranking first among safeties. When dropping back in coverage, James is allowing a passer rating of just 56.3, ranking 17th out of 87 qualifying safeties. There’s nothing that James can’t do, and he should give the Titans problems in all kinds of situations. 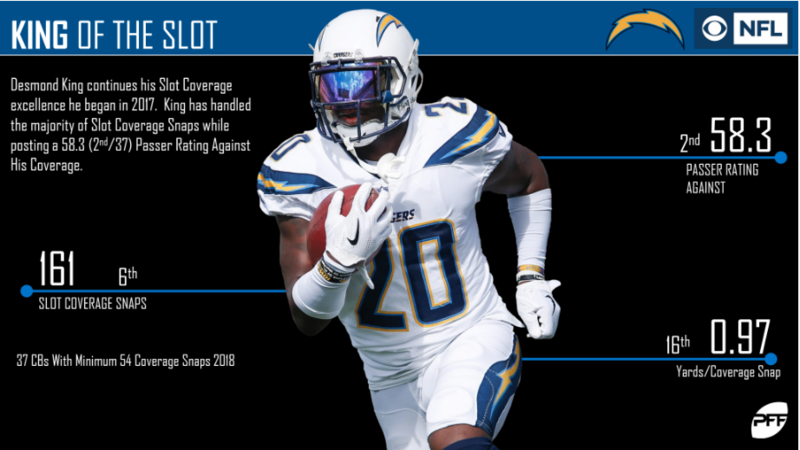 Desmond King is thriving as the Chargers’ slot cornerback. He has allowed a passer rating of 58.3 in the slot, ranking second out of 40 cornerbacks with at least 45 slot coverage snaps. 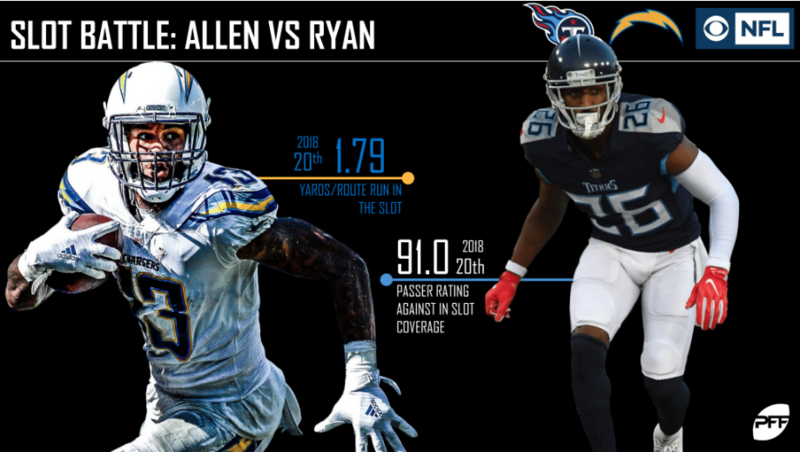 PFF Greenline has projections for the spread, moneyline and over/under of the Titans’ matchup with the Chargers. Get its picks here.